In studies on Muslims in Europe, the first half of the 20th-century is on the rise. Targeting largely undisclosed fields such as the politics of the European Empires towards the Muslim world, Muslim intellectual networks in interwar Europe and encounters with Europeans, recent publications helped to re-chart the map of Muslims in Europe, and through these, re-think the present-day reception of Muslims in Europe, the beginning of which is still famously placed in the 1960s. Instructive in this respect have been David Motadel, “Islam and the European Empires”, which clarifies the main differences in the European colonial approach to the Islamicate world; Jamie Gilham, “Loyal Enemies”, introducing numerous biographies of British converts to Islam, as well as Umar Ryad’s in-depth portrayals of Arab intellectuals and their experience in and with the West, such as Rashid Rida, Zeki Hishmat Kiram and Taqi al-Din al Hilali. The title of the book makes clear that the author prefers to place the Arab intellectual and publicist Sakib Arslan (1869–1946) within this European arena rather than in the simultaneously emerging fields of Arabic nationalism and Pan-Islamism. Arslan’s popular and widely read articles for al-Fath and other Egyptian journals, in which he places Islam at the centre of the Arabic identity, surely destined him to become a key-player in the formulation of Neo-Salafiyya ideology in the Middle East. Numerous publications on Arslan have addressed that fact already (pp. 22–26). Different from these, Mehdi Sajid undertakes the difficult and highly laudable task to target the encounter between Europe and the Arabic and Islamicate world in the interwar period and to draw a picture of Arslan as an actor in both. Arslan’s originality, or so Sajid’s argument runs, lays in the fact that this publicist combated the secular elites in the Middle East and their project of modernising and westernising their countries with the help of observations of what Europeans were planning to do and consequently Muslims should avoid. The fact that he himself lived in Europe was the key to Arslan’s success. Between 1917 and 1946, the year he died, Shakib Arslan travelled through Western Europe as a political representative at first, after which he settled down as an exile. His main domicile was Geneva where he sought out the international and cosmopolitan environment of the League of Nations, although he himself was never a member. Being of aristocratic descent and having spent his youth in American and French mission schools in Lebanon, he spoke a number of European languages, dressed like a European and easily mixed with the European elites. In his constant search for allies against the colonial powers he built a transnational network that brought him in the vicinity of Mussolini and the Nazi elites in Germany. In Berlin, he was a welcome guest in the many Muslim émigré organisations which this city harboured in the interwar period and acted as president or board member in a number of these. He travelled several times to East and Southeast Europe to make contact with local Muslim communities and personalities. Finally in 1935, he organized the first European – Muslim Congress in Geneva with the aim to establish a European network that could voice the needs and demands of Muslims in Europe (pp. 140–147). Throughout, Shakib Arslan acted as a political activist and an agitator for Muslim independence. In this respect he was by no means alone. In the interwar period, students, refugees and businessmen from Middle Eastern countries, British India and Central Asia travelled to the European continent in great numbers to write their dissertations, study the many technical, political and educational innovations, establish contacts and prepare for independence. Berlin especially acted as a magnet outside the Empire, a place where Muslims could (re-)organise and receive support. Where Shakib Arslan differs from the many secular nationalists and Islamist ideologues around him is the fact that he reported his findings on an almost weekly basis in al-Fath and other journals, where he explained to his public, the Egyptian masses, how Europe ticked. In the annex, Mehdi Sajid offers a list of Arslan’s 131 articles in al-Fath. The bibliography features another 30 of his books and pamphlets. Indeed, Sajid’s in-depth analysis of Arslan’s writings occupies almost half of his book (pp. 236–409). It is here that one can learn how this highly intelligent and eloquent publicist minted his ‘European’ arguments against the modernisation of the Muslim world. Claiming profound knowledge of the ‘real’ Europe, Arslan accused Europeans of trying to eradicate Islam with the help of Christian mission and oriental studies, thereby constructing a threat against which Muslims should defend themselves. At the same time, he ascribed to the European governments a fundamental religiosity in their policymaking, thereby accusing Arab and Turkish secularists to tell lies when proposing to separate state and religion in imitation of western legislations. Shakib Arslan wanted to rescue indigenous traditions. Fine. In the eventful history of globalisation he was not the only one to do so, nor was he the last. As a result of his own education, he did not employ theological arguments or otherwise built on the foundation of indigenous learning to defend his position. Instead, he tried to stop the avalanche of changes in Middle Eastern societies – in such different fields as legislation, political institutions, education, industry and gender relations – with an interrelated web of threats and accusations. The evidence Arslan offered, and by which he was believed, based on his encounter with Europeans and his claim to be an eyewitness. It is the tragedy of Arslan’s publicist career that, in his many attempts to rescue at least something the masses back home could identify with, he helped lay the basis for a persisting form of hatred against the West. One hundred years later, Mehdi Sajid, himself a German scholar of Moroccan descent, has undertaken the task to follow the hatred back to its roots and critically inquire how Arslan’s activism was wrought. Contemplating his quiet tone of voice, one is reminded of the art of Anouar Brahem and is brought to understand that the future is still open to change. The book under review should be of an interest to graduate and postgraduate research students, scholars of Islam and global historians interested in gaining a fresh understanding of the historical dynamics leading to such different phenomena as Neo-Salafism, the Islamic State and acts of terrorism. The book provides the groundwork for further debate on how to study these phenomena, – not as part of some essential Muslim or Arab tradition but as part of the encounter that occurred in the interwar period between Europe and the Middle East. David Motadel, Islam and the European Empires, Oxford 2014. Jamie Gilham, Loyal Enemies. British Converts to Islam 1850–1950, Oxford 2014. See: Umar Ryad, Islamic reformism and Christianity. A critical reading of the works of Muhammad Rashid Rida and his associates (1898–1935), Leiden 2008; Umar Ryad, From an officer in the Ottoman Army to a Muslim publicist and armament agent in Berlin: Zekî Hishmat Kirâm (1886–1946), in: Bibliotheca Orientalis 63 (2006) 3–4, pp. 235–268 and Umar Ryad, A Salafi Student, Orientalist Scholarship, and Radio Berlin in Nazi Germany: Taqi al-Din al-Hilali and His Experiences in the West, in: Umar Ryad / Götz Nordbruch (Eds. 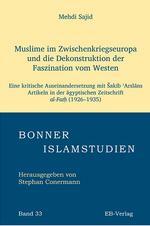 ), Transnational Islam in Interwar Europe: Muslim Activists and Thinkers, New York 2014, pp. 107–155. Gerdien Jonker: Rezension zu: Sajid, Mehdi: Muslime im Zwischenkriegseuropa und die Dekonstruktion der Faszination vom Westen:. Eine kritische Auseinandersetzung mit Sakib Arslans Artikeln in der ägyptischen Zeitschrift al-Fath (1926-1935). Berlin 2015 , in: H-Soz-Kult, 28.07.2016, <www.hsozkult.de/publicationreview/id/rezbuecher-25525>.